Oh, I was dressed perfectly for 40-degree December weather: base layer, fleece, heavy hunting shirt, thermal-lined waterfowl parka, insulated waders. I was warm and dry, but I wasn't hidden from the eyes of ducks -- at all. 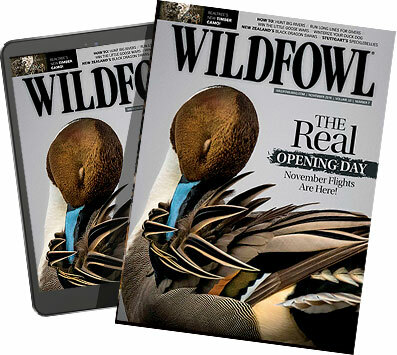 The concept of sitting like a statue on a barnacle and seaweed-covered rock with nary a cattail, blade of grass or camouflage netting to break up my form defied my waterfowl hunting sensibilities. "So this is sea duck hunting," I said tentatively, trying not to offend my hosts by casting doubt on the operation. I was among a throng of five shotgunners who had taken up positions on a protruding island that stretched out for 75 feet in a channel of Penobscot Bay, Maine. Two separate strings of decoys spanned the salt water in front of the shooters. "As long as you stay still, the eiders will come to the decoys," said Grant Brees, a veteran sea duck hunter from Benedicta, Maine. "It works. You'll see." I was just happy we could hunt. A day earlier, winds gusting up to 52 miles per hour roiled the Bay, sending 12-foot waves crashing ashore as we watched from our motel rooms in the quaint lobster town of Stonington. Obviously, we didn't dare venture onto such angry seas. Barely a whisper of wind lingered from Mother Nature's fury as the sun brightened our chosen rock the next morning. The rising tide brushed water gently over my boots as we waited for the day's first flight. A trio of playful sea lions jockeying on a small rock shelf 100 yards away stole my attention. "Eiders," Brees alerted, jolting me back into hunting mode. "Get ready." A dozen ducks skimmed toward us. I had never seen a common eider before, but I had no trouble identifying the sexes in flight, even in low light. The stark white plumage of the mature drakes flashed like a lighthouse beacon with each powerful wingbeat, in sharp contrast to the chocolate brown hens. My heart raced as the wave of eiders winged within a couple hundred yards, seemingly on a direct line to the end of my gun barrel. Inexplicably, the flock drifted and then veered wide of our island, as if they were negotiating a marked lane on a highway. I marveled without disappointment as the majestic ducks spurned our decoy spread and passed directly over the sea lions. About 24,000 pairs of common eiders nest on 340 islands in Maine, according to Brad Allen, the state's migratory bird biologist. Maine is the only state in the lower 48 with a nesting population of eiders. Hunters are allowed to take four eiders daily, and the population is relatively stable from year to year. But eiders weren't always so plentiful in Maine. In the 1800s, fishermen and farmers took up residence on most of the nesting islands, disturbing the ducks. Worse, they raided nests for eggs and killed the ducks for meat and feathers. In addition, livestock grazing degraded nesting cover on larger islands. By 1907, only two nesting pairs remained in Maine. Early in the 1900s, the American Ornithologist's Union developed model laws for bird protection. Spring shooting and egg collecting was abolished, and eiders were afforded protection of a closed hunting season. In Maine, colony wardens and lighthouse tenders were hired to enforce trespass laws on islands with active nesting colonies. The Migratory Bird Treaty Act of 1918 placed a 10-year moratorium on hunting common eiders. Maine extended the closed season on eiders through 1932. Recovery was slow. In the 1940s, the Maine nesting population had built to 2,100 pairs. By the 1970s, aided by better habitat protection on many coastal islands, about 20,000 pairs were nesting. Today, black-back gulls, herring gulls and bald eagles are the primary threats to eider nest success. Maine's nesting eiders certainly are known to migrate down the coast to Massachusetts, but many of the ducks spend winter in the state's coastal waterways, where they feed primarily on blue mussels. 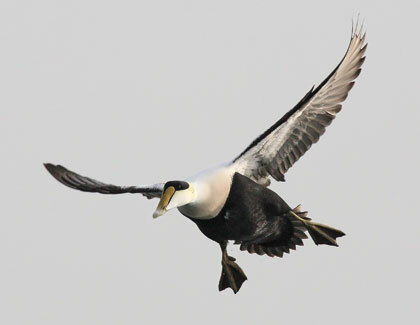 Maine's wintering eider numbers include ducks that migrate from Nova Scotia, Labrador and Newfoundland. An annual mid-winter index has found as many as 60,000 eiders in Maine, although typically, the survey shows closer to 40,000 birds. The next flock of the morning numbered 20 eiders, with another string of 30 ducks nearly scraping the water's surface 100 yards behind the tail of the lead bunch. All of them passed just outside of shotgun range. An impressive onslaught of sea ducks had begun. They came in sixes, dozens and 40s, but no matter the size of the wave of birds, they steered around our rock. "They aren't cooperating today, but it's early yet," said our host, Linda Powell, then of Remington Arms. Powell, who has pursued brown bears in Alaska and made multiple safaris to Africa, counts her annual trek to Maine to hunt eiders among her favorite hunts. I wasn't worried. We were seeing a lot of eiders, and I was certain that eventually, a few of them would work into range. Still, I wondered if all of the "bumps" on our island looked unnatural to the eiders and caused them to avoid us. The ducks had no aversion to flying directly over another smaller, albeit flatter, rock formation a stone's throw away. The "grass is greener" syndrome set in -- I wished I were over there. I suspect I wasn't the only one seriously pining for a shot at North America's largest duck at that point in the hunt. "Time to move again," said Bill Brown, a veteran sea duck hunter from Readfield, Maine. We weren't leaving. Rather, we simply needed to reposition ourselves on the shrinking rock. Brown and his boatmate, Wally Martin, pulled the decoy lines closer to the group as each shooter retreated up the formation to escape the rapidly rising tidal water. More eiders approached. A few of the flocks swung tantalizingly near. I didn't flinch. Then, a drake broke free of its flock, arching off of the established flight plan. Our decoys suckered him the rest of the way, and one of my hunting partners sent the giant duck crashing to the salty bay. Another of our Maine hosts, Shawn Prince, sent his Lab after the stone-dead duck. A moment later, the retriever climbed back onto the rock. Shutters clicked as the dutiful dog relinquished the trophy to his master. After feeling the heft of the bird and admiring its subtle, yet striking colors, I slid my camera back into my blind bag. I clutched my Remington semi-automatic shotgun and scanned the horizon. A small wad of eiders approached the island head-on. Would they keep coming? They did. Perfectly. But I would have to wait. Instead, P.J. Reilly, a frequent contributor to Wildfowl, rose and fired at the birds. His second shot sent the only drake in the flock careening. After a valiant chase by Brees's black Lab, Reilly's first eider was in hand. Success energized the group. We repositioned again, in part out of necessity because of the continued rising water level. As the last of the outdoor writers yet to pull the trigger, I was encouraged to move to the front of the firing line. Scott Hanes, shotshell brand manager for Remington, was stationed just to my left on a finger of the island closest to a string of decoys. Like me, he had never shot an eider. "We're on the hot seat now," I chided. "We'd better not miss." The morning feeding migration continued. Waves of eiders teased and tempted us. One flock fooled me into thinking they were going to be too far, but then bent within range for a second as they blew past. I could have shot. I should have. A moment later, my indecision was erased. The largest eider contingent of the morning was methodically growing into view. The line strung out for 100 yards -- no fewer than 75 eiders were destined to pass our rock. "Come on," I coaxed, trying not to wiggle with excitement as the birds stayed on course to intersect our air space.The leaders started to fade away, but a subgroup deeper in the squadron of sea ducks reset the path in our favor. I locked onto a white bird and swung hard to stay in front. Hanes and I fired simultaneously, and a pair of eiders dropped. Hanes had killed his duck cleanly, but mine briefly dove, and then surfaced head up. I fired again. Both Labs sprang into action. Scoter, a small female black Lab owned by Brees, huffed toward my downed eider. The duck dove outside of shotgun range, so Martin and Brown quickly hopped into the boat to assist the retriever. She didn't need any help. Before the men could reach the duck, Scoter had plucked it from beneath the surface and was on her way back. "Congratulations," Brees said as he handed me the largest duck of my 30 years as a waterfowl hunter. I stood on a rock in a bay connected to the Atlantic Ocean, carefully examining the spongy shield covering the top of the exceptionally long duck's bill. I stretched out the eider's impressive wings and was again struck by the sheer size of the bird. So this was Maine eider hunting. Keep Shooting Brees had warned me. "Eiders are tough ducks," he said. "If they're moving at all, shoot them again. It takes a lot to kill them." We were shooting tightly choked 3¹â'„â‚‚-inch Remington 887 pumps and 11-87 semi-automatics loaded with Wingmaster HD tungsten shotshells -- certainly lethal firepower for any duck hunt. Still, the eiders repeatedly took extra loads to subdue. The second morning, I covered a perfectly decoying drake with my pattern at no more than 20 yards. The eider immediately crashed and dove. The next time I saw that duck, it was surfaced 200 yards away. After a few seconds on the surface, it dove again and was gone. Thankfully, it was the only eider we lost. Our group took 16 eiders during the two mornings. As so often happens, the ducks began to readily decoy about the time we had to return to the landing to pack for the flight home. Every aspect of the Maine eider hunt -- from the tactic of blending in with the stone on a shrinking island to the sheer largeness of the ducks themselves -- was unusual. But just the same, hunting these once-threatened sea birds was every bit as spectacular as I thought it would be.